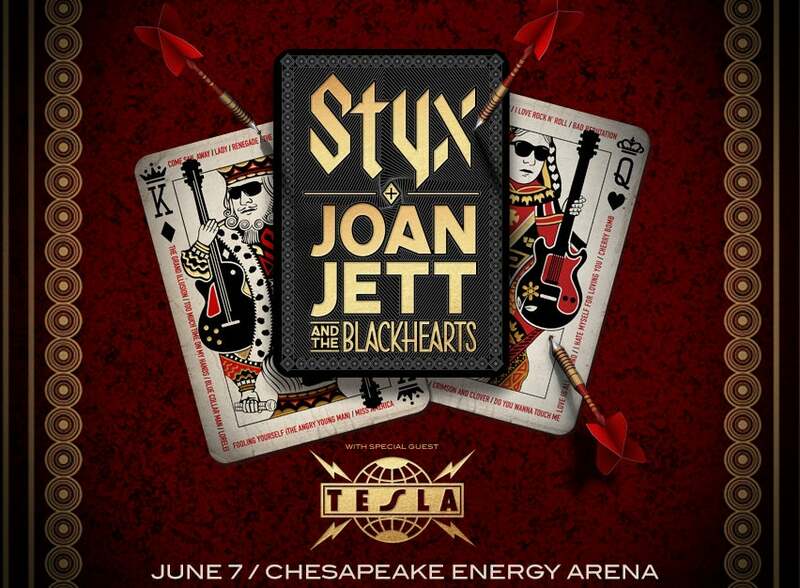 LOS ANGELES, CA (February 13, 2018) – Legendary rockers STYX and JOAN JETT & THE BLACKHEARTS are teaming up with TESLA for a summer U.S. tour that kicks off May 30 in Irvine, CA at the FivePoint Amphitheatre. STYX: Tommy Shaw (vocals, guitars), James “JY” Young (vocals, guitars), Lawrence Gowan (vocals, keyboards), Todd Sucherman (drums) and Ricky Phillips (bass), along with the occasional surprise appearance by original bassist Chuck Panozzo—would eventually transform into the virtual arena rock prototype by the late '70s and early '80s, due to a fondness for big rockers and soaring power ballads. Over the course of their 40-year career they’ve released 15 studio albums, six best-of compilations and four live albums, garnering eight Top Ten singles. STYX has sold over 30 million albums worldwide. Throughout their illustrious career, they’ve performed more live shows since 1999 than all of the previous years of its career combined. Two Super Bowl appearances, Pollstar box office chart-topping tours with Def Leppard, Journey, Boston, and Bad Company (to name only a few), two more studio albums. September 2, 2016 marked the long-awaited release date of STYX: LIVE AT THE ORLEANS ARENA LAS VEGAS on DVD, Blu-ray and Digital Formats via Eagle Rock Entertainment. It captures the band performing in July 2014 such fan favorites as: “Too Much Time On My Hands,” Fooling Yourself (The Angry Young Man),” “Renegade,” and more. It also includes a special surprise visit from Don Felder—formerly of the Eagles—for a rousing performance of “Blue Collar Man (Long Nights).” It was released on CD July 24, 2015. After 14 years, STYX’s sonically sweet 16th studio album and its most ambitious, most challenging, and most rewarding album to date, THE MISSION, was finally released June 16, 2017 on the band’s label, Alpha Dog 2T/UMe. It debuted on various Billboard charts, including: #6 Top Rock Albums, #11 Physical Albums, #11 Vinyl Albums, #13 Current Albums, #14 Billboard Top Albums, #16 Retail, #17 Mass Merch/Non-Traditional, #29 Digital Albums, and #45 Top 200 Albums (includes catalog and streaming). TESLA: Over the course of their thirty-five-year career, the iconic Sacramento melodic hard rock quintet—Frank Hannon (guitar), Brian Wheat (bass), Jeff Keith (lead vocals), Troy Luccketta (drums), and Dave Rude (guitar)—sold more than 25 million albums domestically and played globally to sold-out crowds far and wide. To say TESLA live is absolutely bombastic is an understatement, they are a hard rock band to beat all hard rock bands. TESLA’s ninth full-length album titled SHOCK is due out fall of 2018. The highly anticipated album features Phil Collen of Def Leppard in the producer’s chair and takes a big leap forward as they glance back on their MECHANICAL RESONANCE LIVE! album.